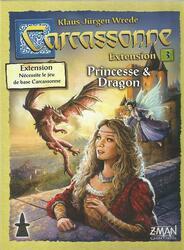 This third expansion to Carcassonne brings an element of fantasy. The country surrounding Carcassonne is assaulted by a majestic dragon, making the lives of supporters very difficult. Heroes and adventurers try hard to resist, but without the help of the fairy, they fight in vain. The princess recruits various knights to constitute her guard of honor. Meanwhile, the peasants discover magical portals that allow them to reach unexploited places and, they hope, beyond the reach of the dragon.